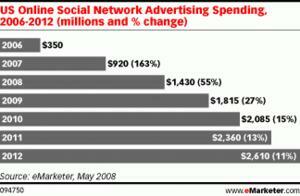 NEW YORK, NY--(Marketwire - May 13, 2008) - The dollars don't equal the hype in social network ad spending. eMarketer has revised downward its projections for US social network ad spending, now estimating that advertisers will spend $1.4 billion to place ads on social networks this year, down from the previous projection of $1.6 billion. The poor economy is partly responsible for the revised estimates, particularly for those companies who will cut experimental ad dollars first. But as important, "social network sites are still trying to figure out what sort of advertising works," said Debra Aho Williamson, senior analyst, who authors the social networking reports. "Tapping into consumers' conversations and spreading brand awareness virally has proven more challenging than companies originally thought." eMarketer has revised its forecast for the two largest social networks, MySpace and Facebook. In its previous prediction, eMarketer said MySpace would bring in $850 million in the US, but that estimate has now dropped 11.2% to $755 million. At Facebook, advertisers will spend $265 million, a 12.9% drop from the earlier forecast of $305 million. For more information on social networks, or to speak with Ms. Williamson, contact the media staff listed below. eMarketer is "The First Place to Look" for research and analysis on digital marketing and media. eMarketer analyzes research from over 3,000 sources, and brings it together in analyst reports, daily articles and the most comprehensive database of online marketing statistics in the world.